Voyages Overland is bringing a new way to travel called ‘overlanding’. They’ve got fully equipped off-roading trucks named Bonnie and Clyde that take you around the country for camping trips. Ever Taken A Road Trip Like This? If the purpose of travel in a nutshell for you is meeting like-minded people, going to new destinations, and having offbeat experiences, you’ll love this. Voyages Overland is introducing us to a new kind of travel, which packs all those elements together. Enter: Overlanding. Overlanding is basically travelling in their customised trucks—Bonnie and Clyde—which take you to offbeat (and off-road) destinations that are inaccessible to other modes of transport. 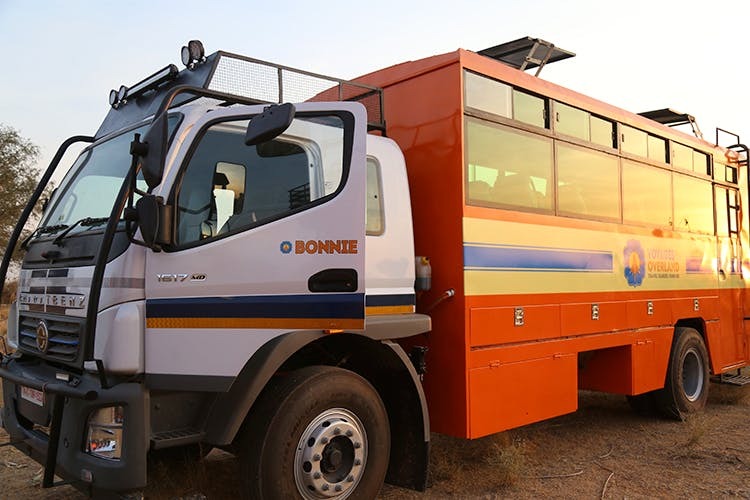 Bonnie is the passenger truck—fully air-conditioned with a mini-fridge, lockers, and rooftop seating so you can take in the view as you travel. Clyde is the utility truck with a fully-functional kitchen, a washing machine, and five bathrooms with hot and cold water—talk about total travel convenience! The camping tents they have take only about five minutes to set up, and have all the essential equipment like cots, mattresses, pillows, and sleeping bags for a good night’s sleep. Their trips include camp nights (they’ve even got a projector so you can have movie nights in the wilderness), homestays, and experiential properties. And, if you’re a big group, you can get in touch with these guys and go on a customised trip created specially for you and the gang. Check out Voyages Overland for some offbeat destinations and take your road trips to another level. Check out their upcoming trips, book custom ones, and get more info on their website.